← How to hold a hamburger properly. Shared email! That is just adorable! I’ve heard a lot of that today! Thanks so much for the comment and visiting! No problem! Stumbling into your joint blogs/comments was like stumbling into a sugar-induced diabetic coma of syrupy sweetness. Gosh, you have a very popular blog! Congratulations! Btw, i had no idea there was any correct way to hold a hamburger! Lol! I’m just one of those people who spotted you on the Freshly Pressed list… Just wanted to say: thanks for making me laugh! I didn’t start reading the article about ‘how to hold a hamburger properly’ expecting to chuckle, but… lo’ and behold. 🙂 Now I want a hamburger! Congrats! Definitely will be checking out your wife’s blog. Wow, it looks like hamburgers play a big part in your life. Congrats! That is how I found your blog. 🙂 But i gotta say, there is some pretty funny stuff on here and I will be back. Congrats on the success! Also, if anyone is willing to make that masterpiece of a burger for me, I scarf it down like there is no tomorrow. All I need is one lazy Sunday afternoon, and I’m sure I could conquer that beast. Great post! I’ve enjoyed reading your FP post as well as this one and your wife’s post from the day you got pressed. Both are great blogs! Holy gut ache Batman! 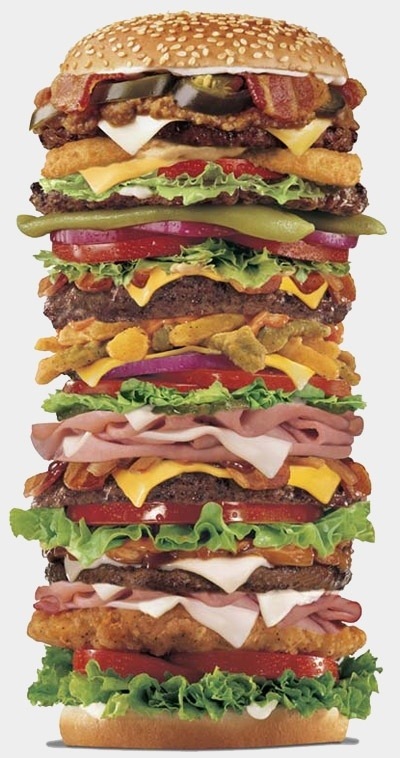 That is a massive heart attack waiting to happen! Tell your wife thank you for encouraging you to blog. My dear, I will keep an eye on yor blog. Hamburgers are very popular even in Russia where I am from. Thank you for your sense of humour! And the support of your dear wife is very touching. That is great!